Was a giant comet responsible for a North American catastrophe in 11000 BC? 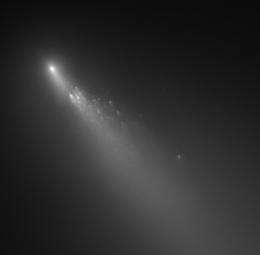 (PhysOrg.com) -- 13,000 years ago the Earth was struck by thousands of Tunguska-sized cometary fragments over the course of an hour, leading to a dramatic cooling of the planet, according to astronomer Professor Bill Napier of the Cardiff University Astrobiology Centre. He presents his new model in the journal Monthly Notices of the Royal Astronomical Society. The main cause of a rapid global cooling period, known as the Big Freeze or Younger Dryas - which occurred nearly 13,000 years ago - has been identified thanks to the help of an academic at the University of Sheffield." -Is this the same event? Are these guys at odds with each other? Did comets cause the great flood? Does somebody need to make a few phone calls? At odds with each other? No. The putative comet caused the flood. Abstract: Using Google Earth and browsing the geographic appearance of the Earth’s crust starting from the South Pacific Ocean right above Antarctica and traveling over to Drake’s Passage and into the South Atlantic Ocean there seems to be a visual trace that some sort of cosmic collision occurred in that area. The impact of the object surfed across the ocean and collided with the bottom of South America where it once connected to Antarctica creating Drake’s Passage opening. This impact also may have had the kinetic energy to break the Earth’s crustal plate and create the fault lines in addition to changing Earth’s axial tilt. [Report and Opinion. 2010;2(2):1-2]. (ISSN: 1553-9873).